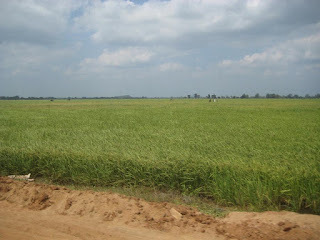 I have seen many paddy fields in the western parts of Sri Lanka but none so large as in Ampara District. You can see these fields stretch till the horizon. The cultivation is done using big scale machines nowadays and the crops are enough to feed millions. in theory these should be have the lowest cost of production as well making these farmers some of the most productive paddy farmers in the land. In contrast I reckon with my little field I am one of the more inefficient ones. I like your photos, a time line on when they were taken will be useful to know. harvester in your blog and saw similar but bigger machines all over Ampara. Think investments are done according to the scale of operation and feel it is a step towards the right direction from the traditional methods of farming! Above photo was taken in the second week of Feb 09.